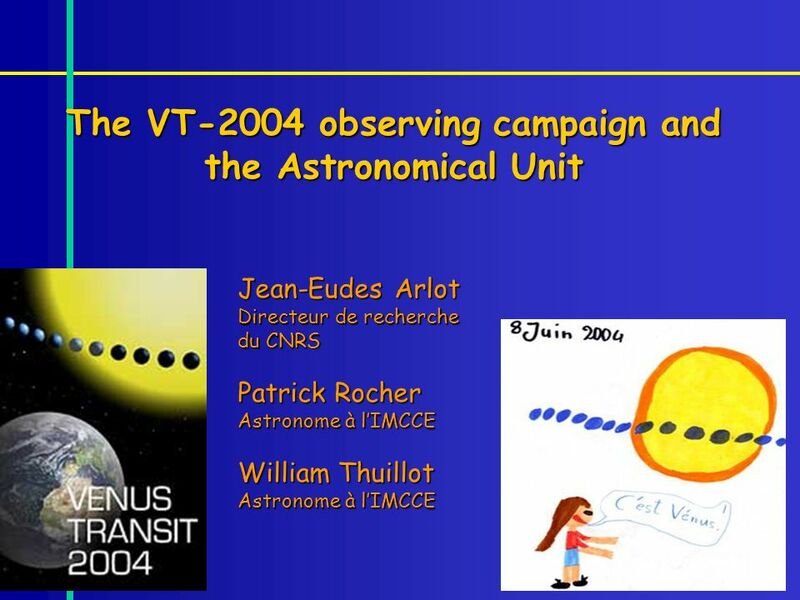 The VT-2004 observing campaign and the Astronomical Unit Jean-Eudes Arlot Directeur de recherche du CNRS Patrick Rocher Astronome à lIMCCE William Thuillot. 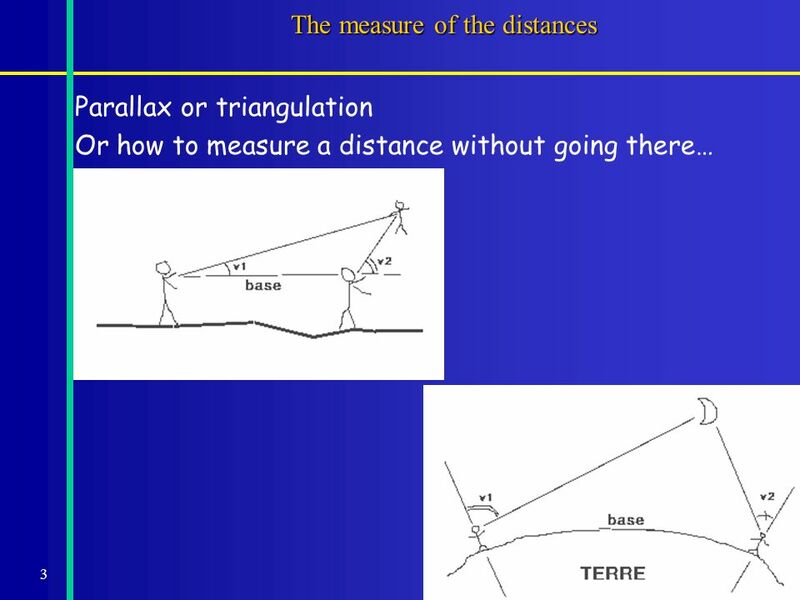 6 6 The parallax The method of the parallax allows to measure distance to objects close to the Earth. 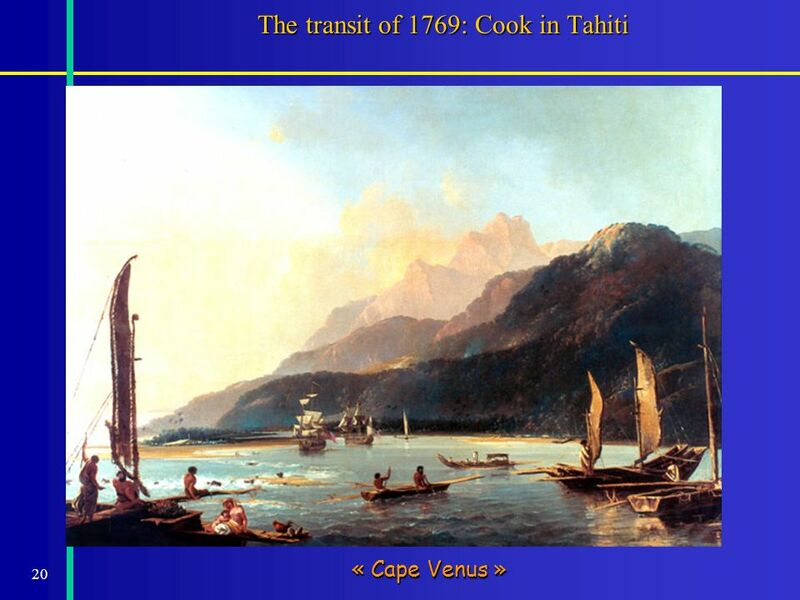 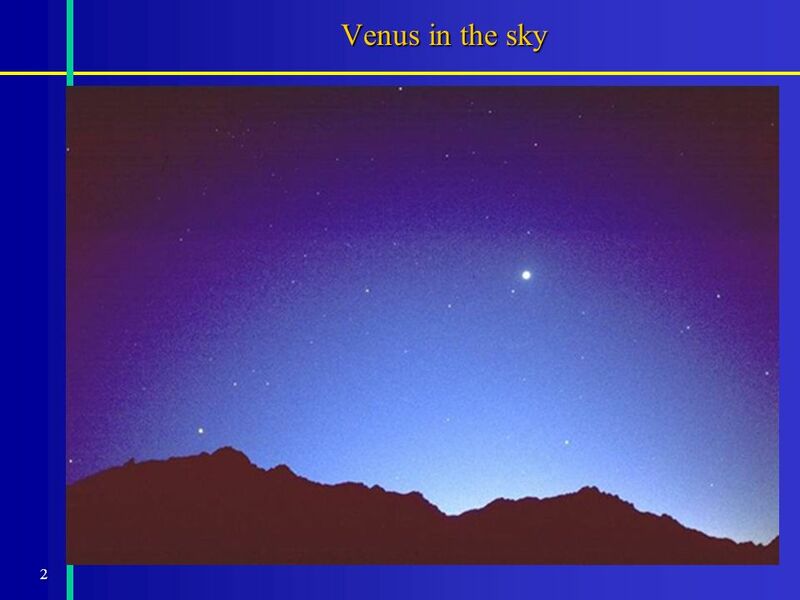 The Sun is too far: only Venus and Mars are accessible. 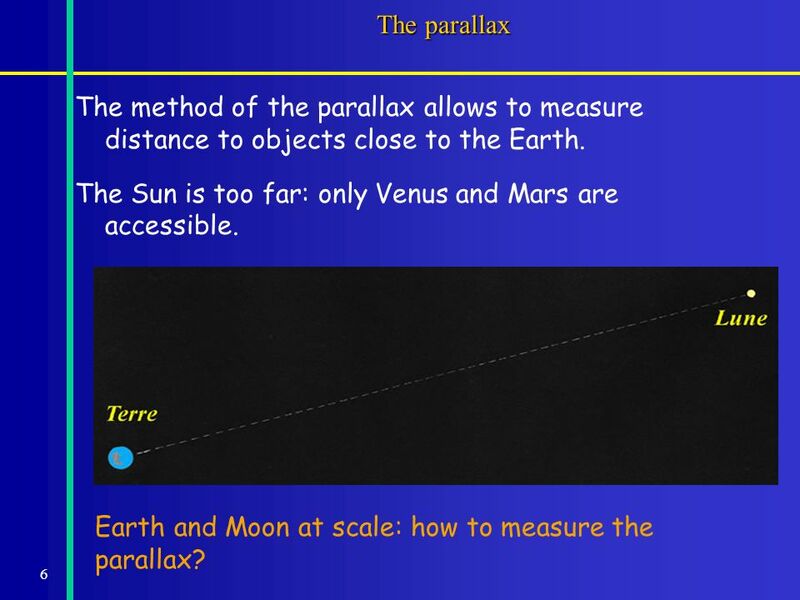 Earth and Moon at scale: how to measure the parallax? 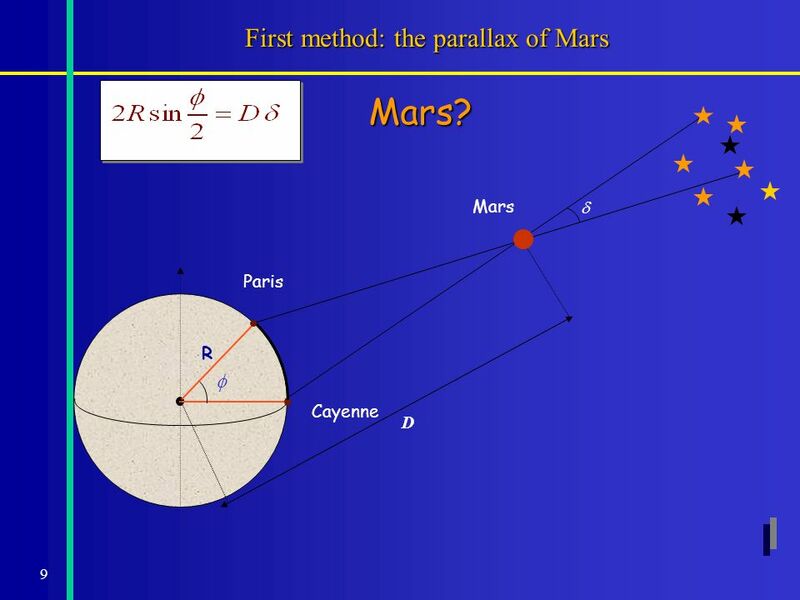 9 9 First method: the parallax of Mars Cayenne Paris R D MarsMars? 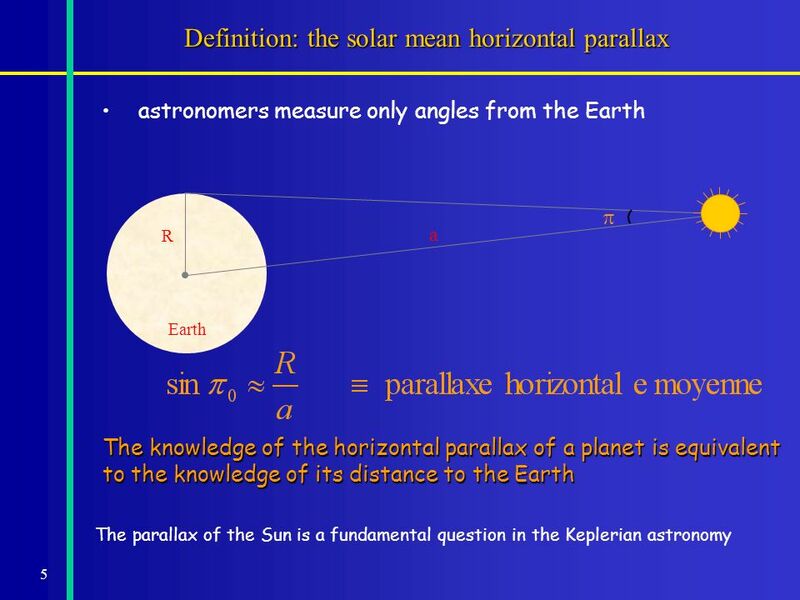 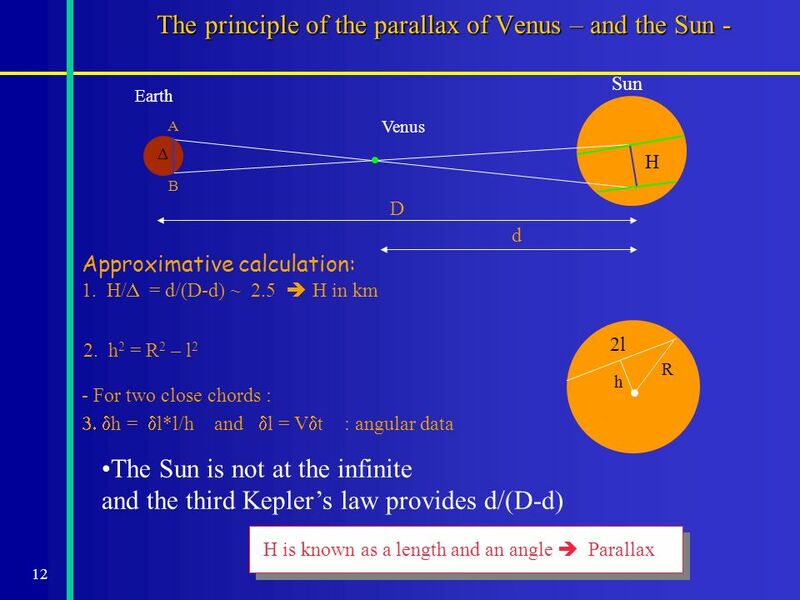 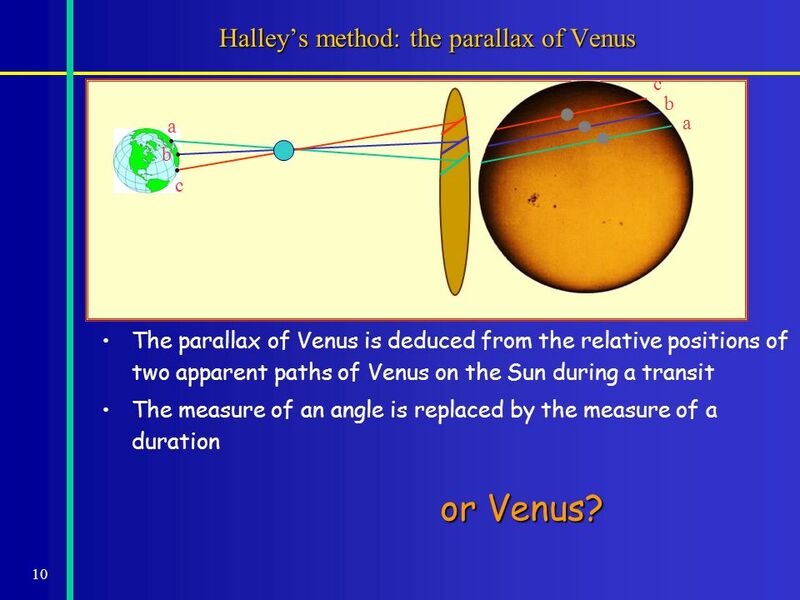 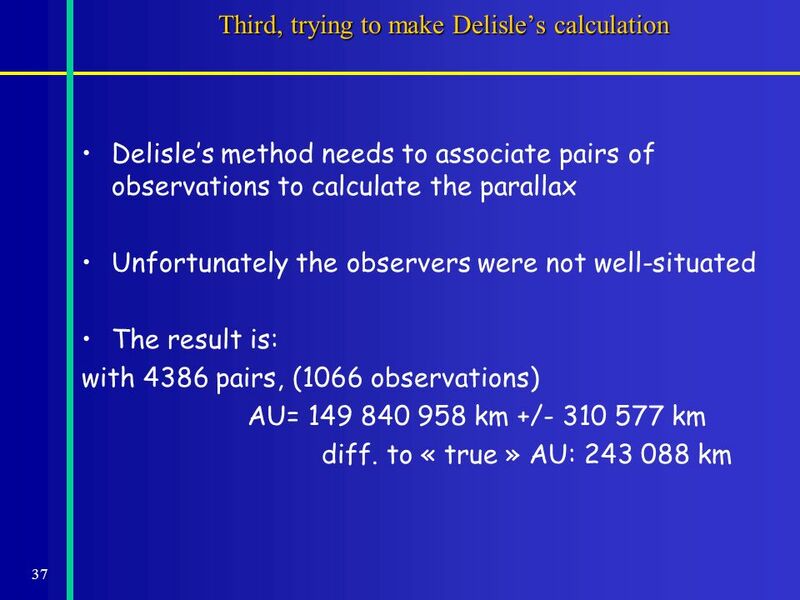 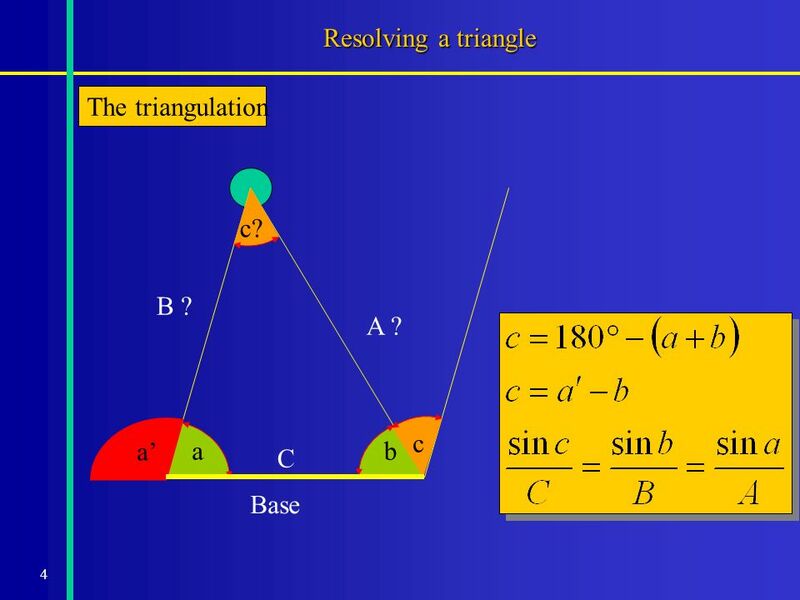 10 10 Halleys method: the parallax of Venus a a b b c c The parallax of Venus is deduced from the relative positions of two apparent paths of Venus on the Sun during a transit The measure of an angle is replaced by the measure of a duration or Venus? 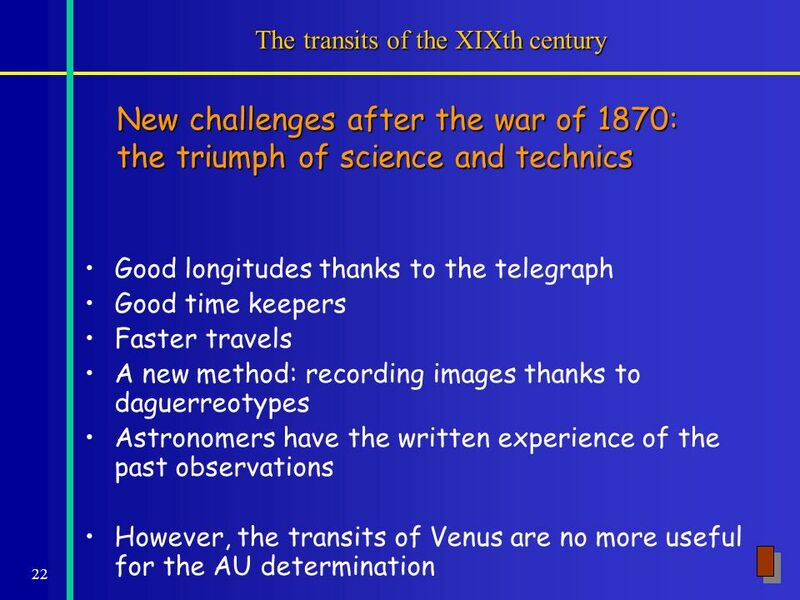 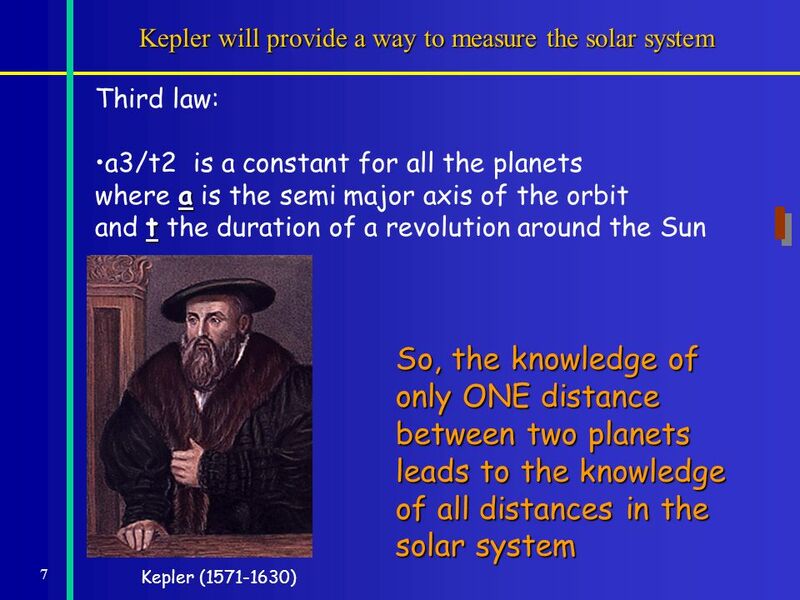 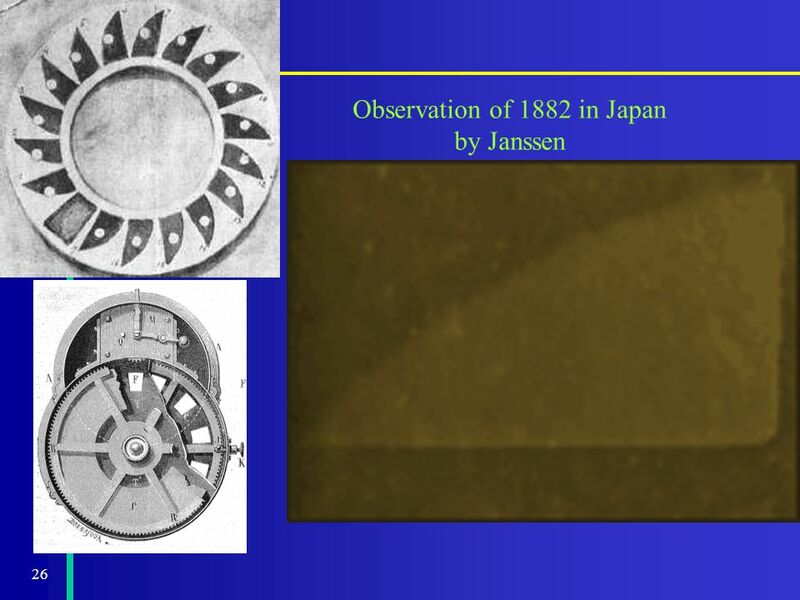 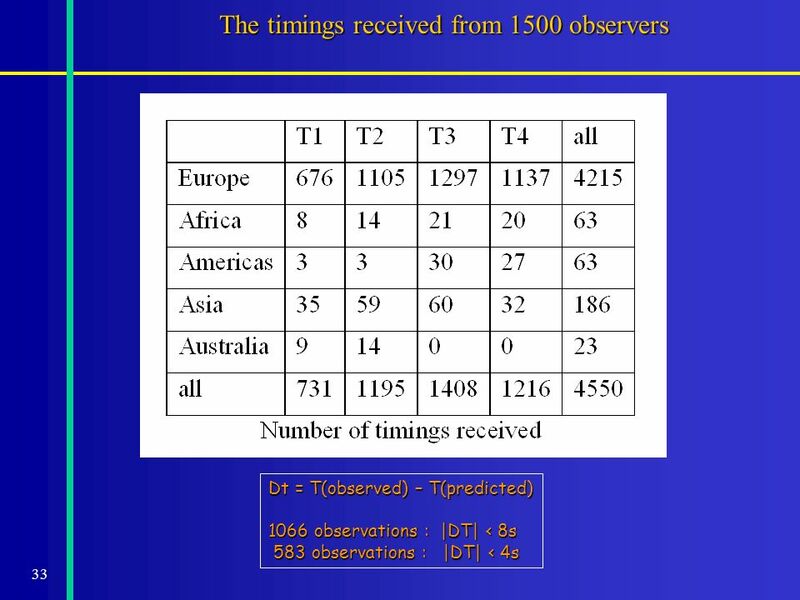 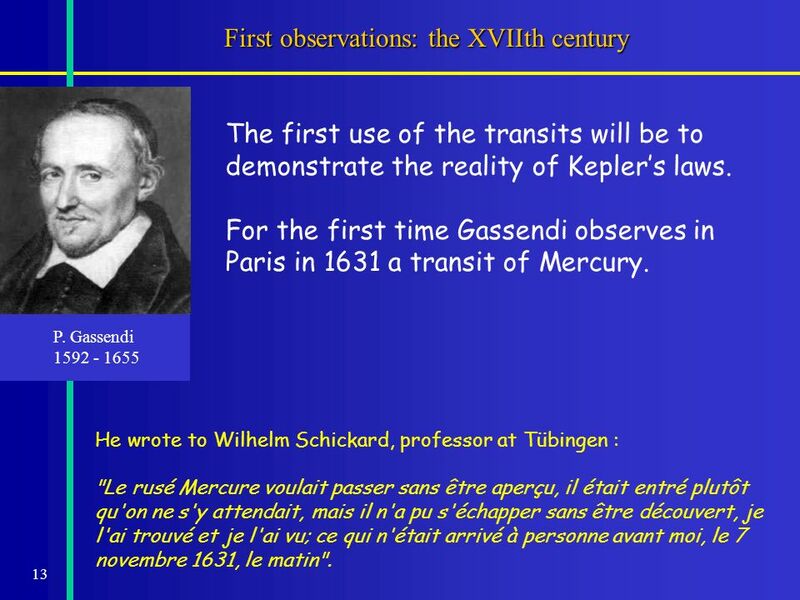 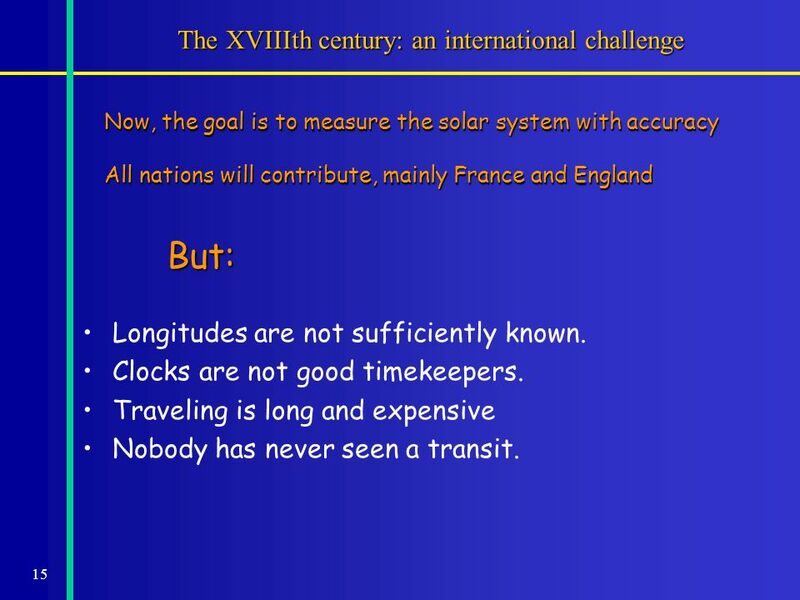 13 13 First observations: the XVIIth century P. Gassendi 1592 - 1655 The first use of the transits will be to demonstrate the reality of Keplers laws. 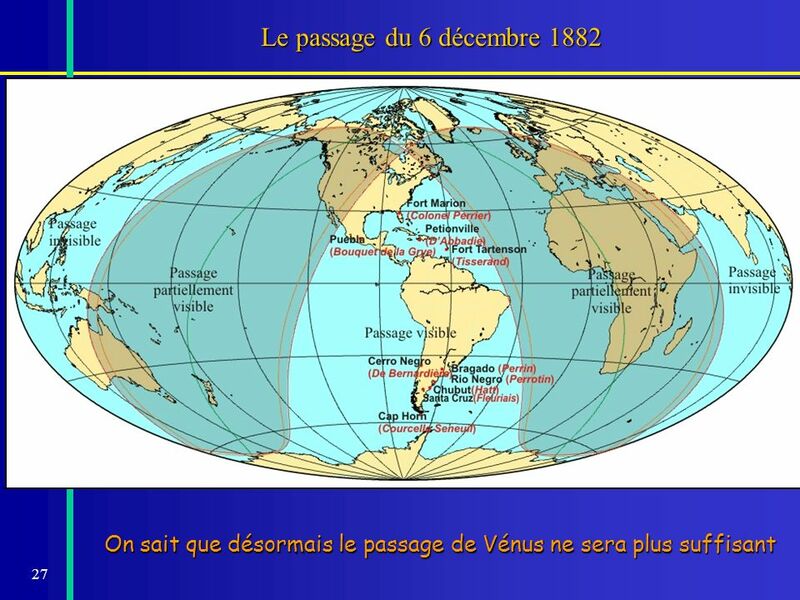 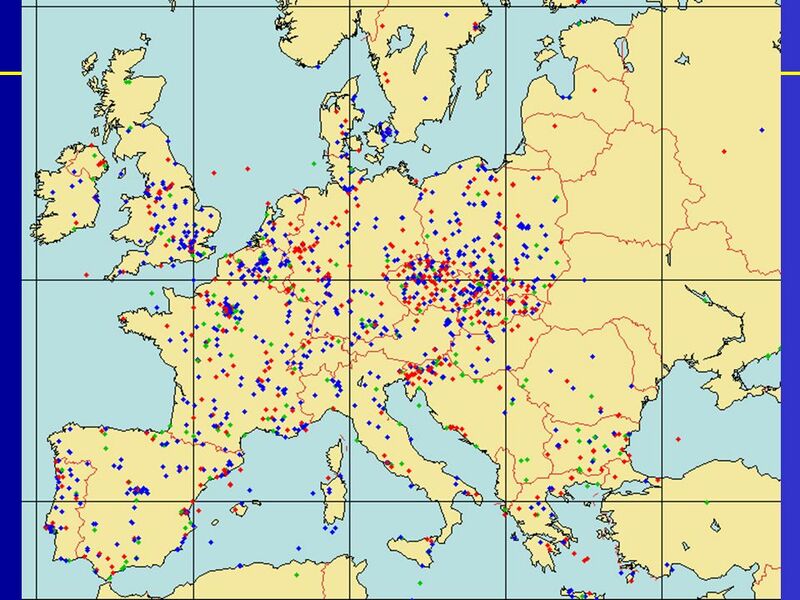 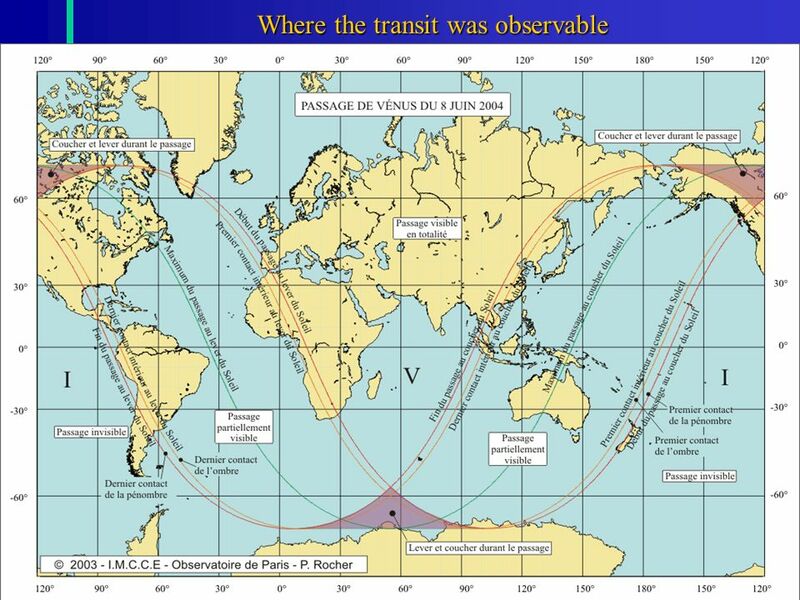 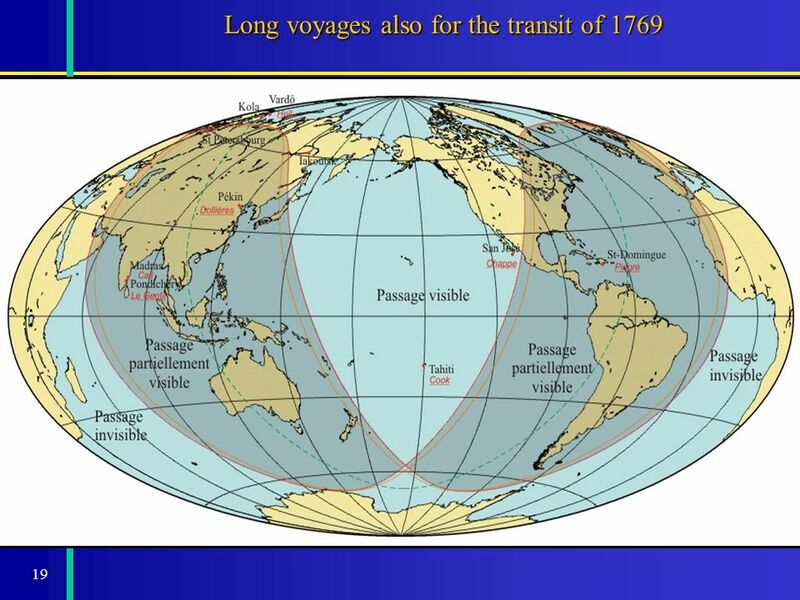 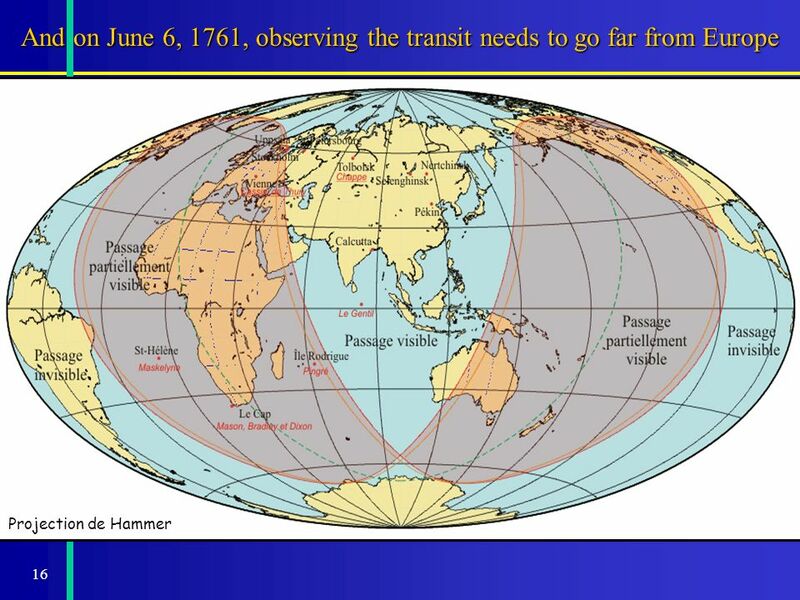 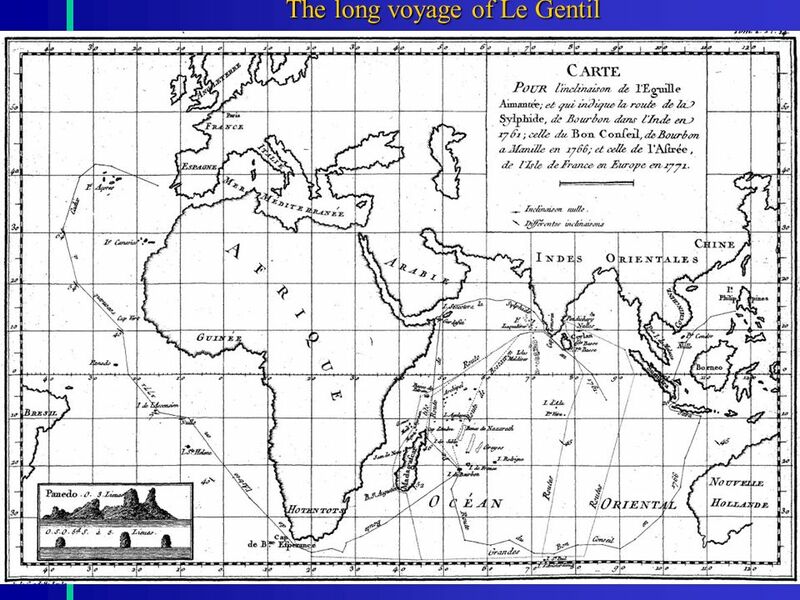 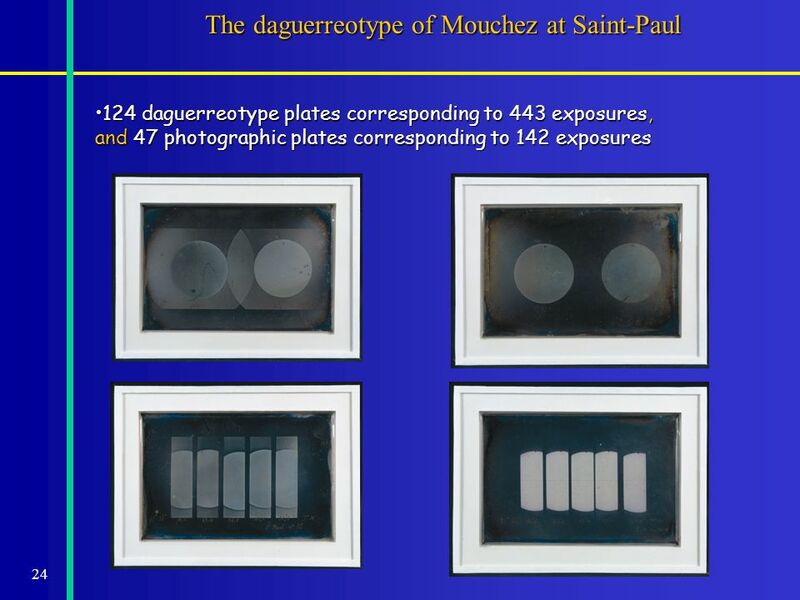 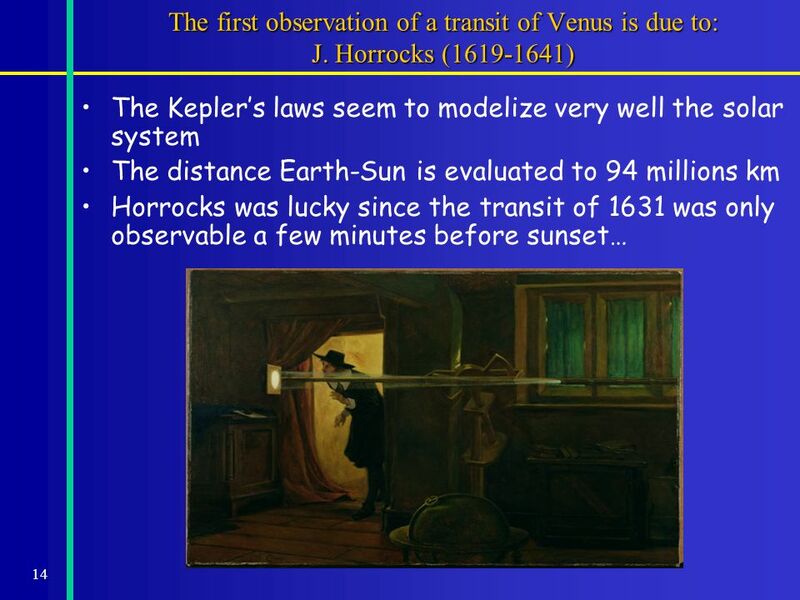 For the first time Gassendi observes in Paris in 1631 a transit of Mercury. 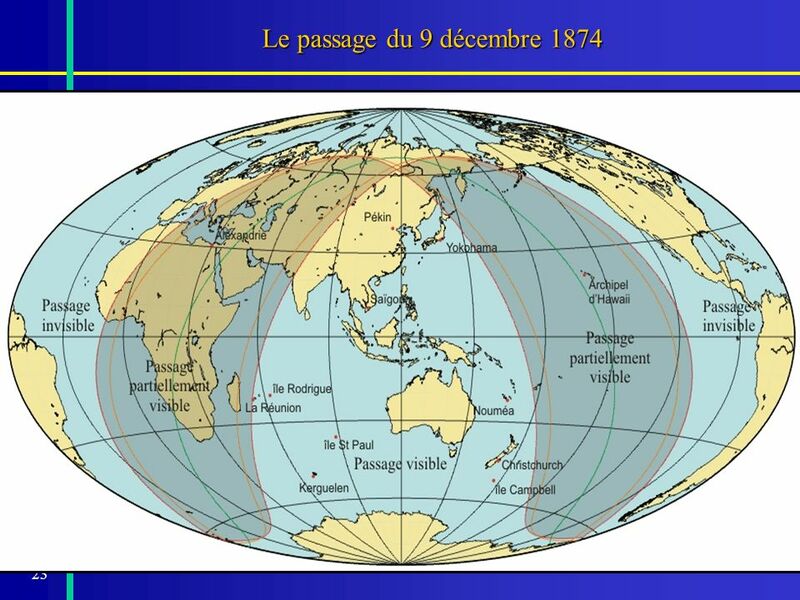 He wrote to Wilhelm Schickard, professor at Tübingen : "Le rusé Mercure voulait passer sans être aperçu, il était entré plutôt qu'on ne s'y attendait, mais il n'a pu s'échapper sans être découvert, je l'ai trouvé et je l'ai vu; ce qui n'était arrivé à personne avant moi, le 7 novembre 1631, le matin". 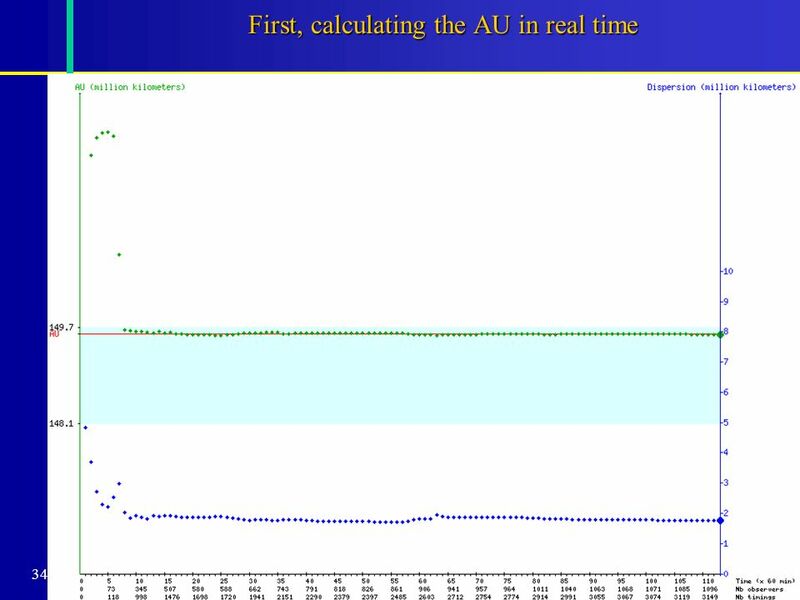 35 35 The calculation of the AU in real time On June 18On June 18 Registered: 2228Registered: 2228 Observers: 1440Observers: 1440 Contacts observed: 4367Contacts observed: 4367 AU calculated = 149529684kmAU calculated = 149529684 km Diff. to AU = 68186 kmDiff. 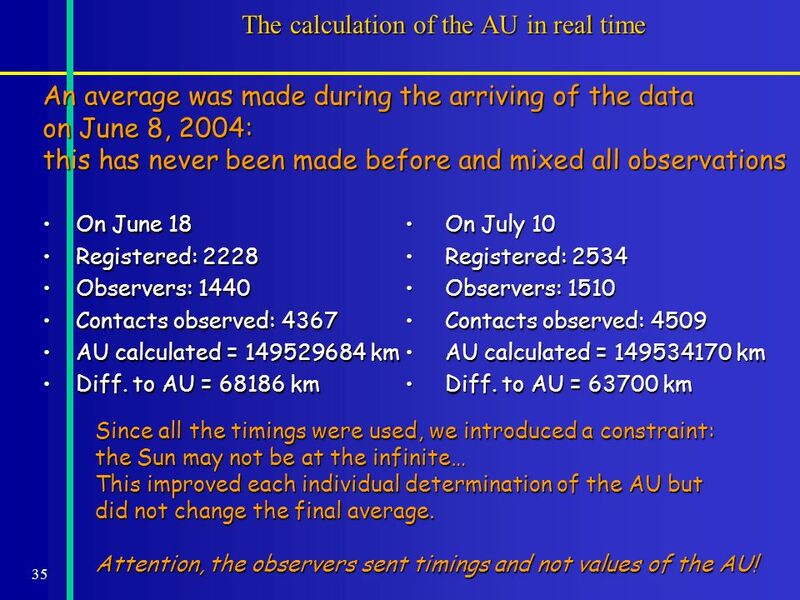 to AU = 68186 km On July 10On July 10 Registered: 2534Registered: 2534 Observers: 1510Observers: 1510 Contacts observed: 4509Contacts observed: 4509 AU calculated = 149534170 kmAU calculated = 149534170 km Diff. 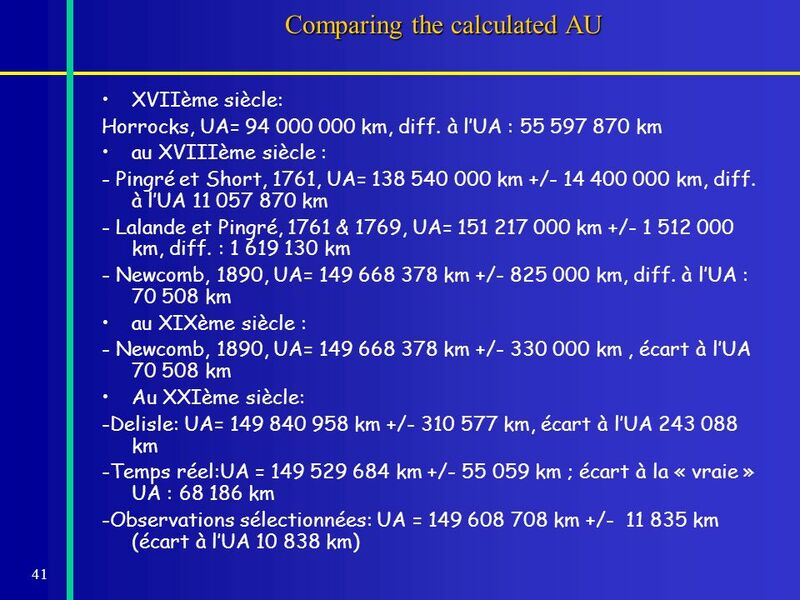 to AU = 63700 kmDiff. 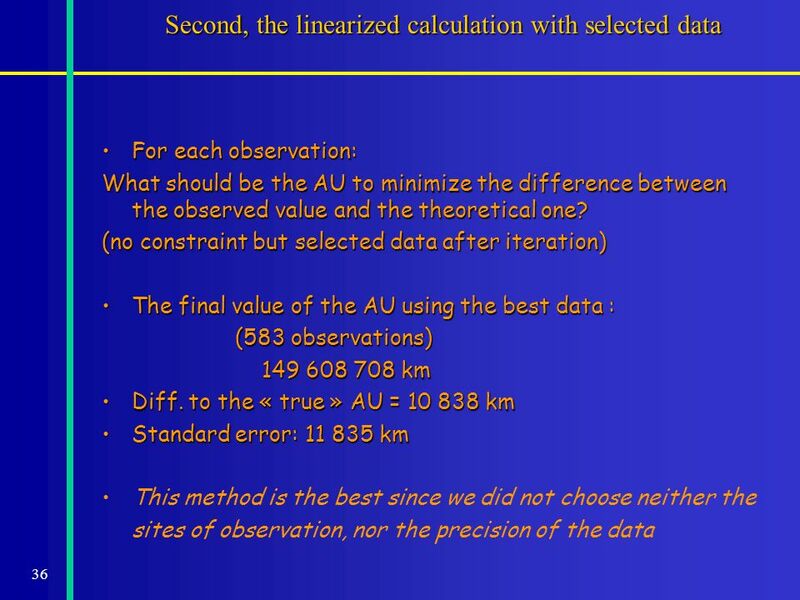 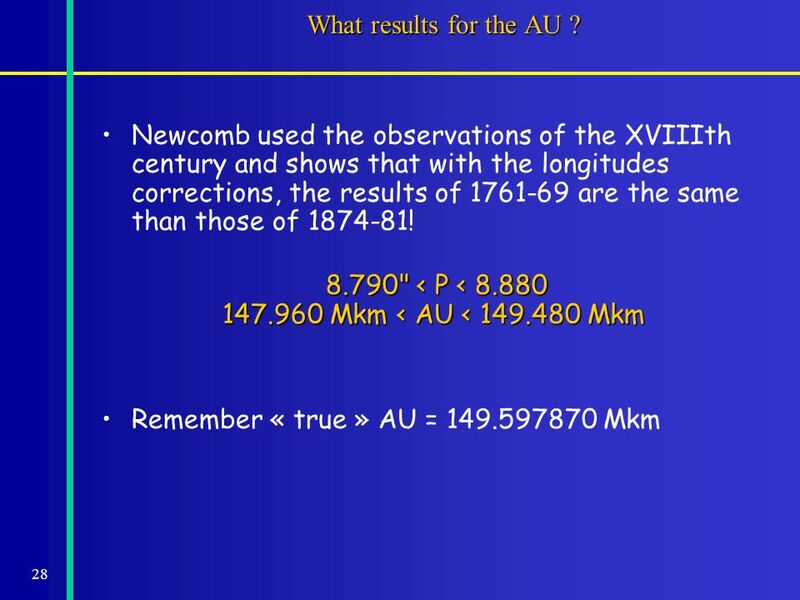 to AU = 63700 km An average was made during the arriving of the data on June 8, 2004: this has never been made before and mixed all observations Since all the timings were used, we introduced a constraint: the Sun may not be at the infinite… This improved each individual determination of the AU but did not change the final average. 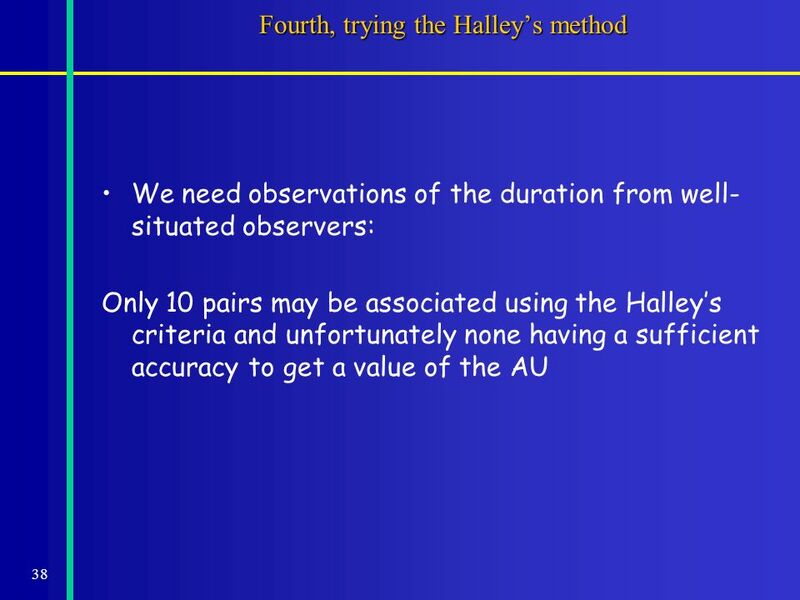 Attention, the observers sent timings and not values of the AU! 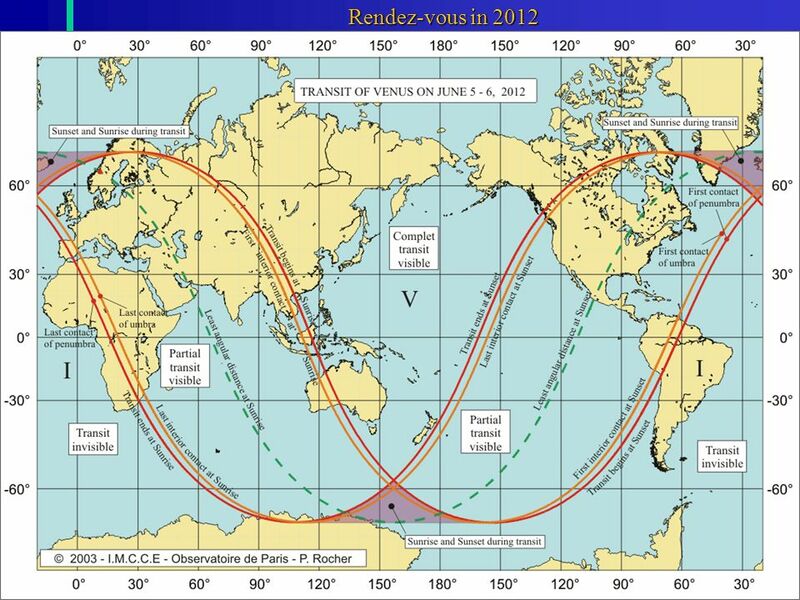 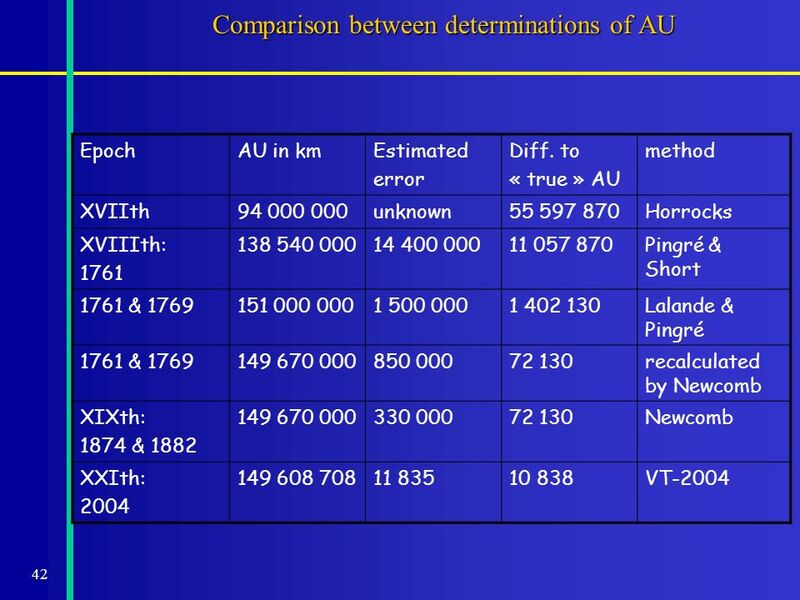 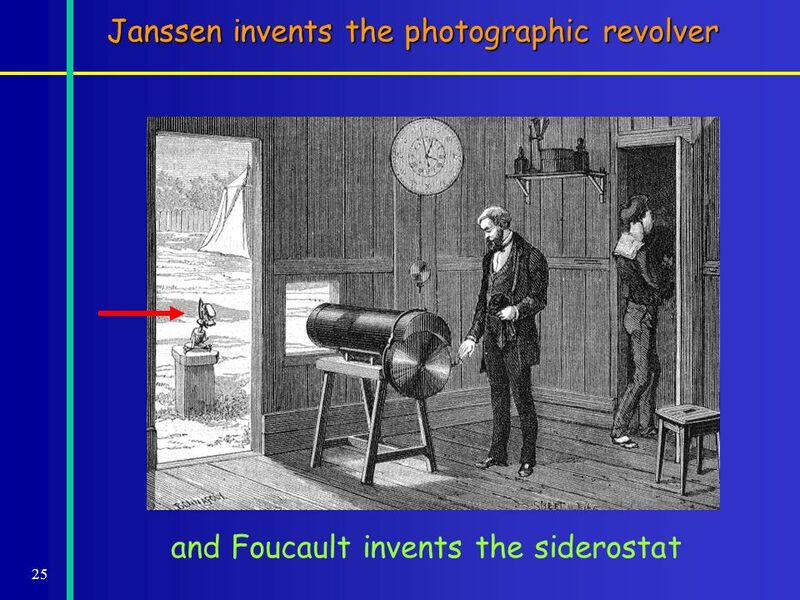 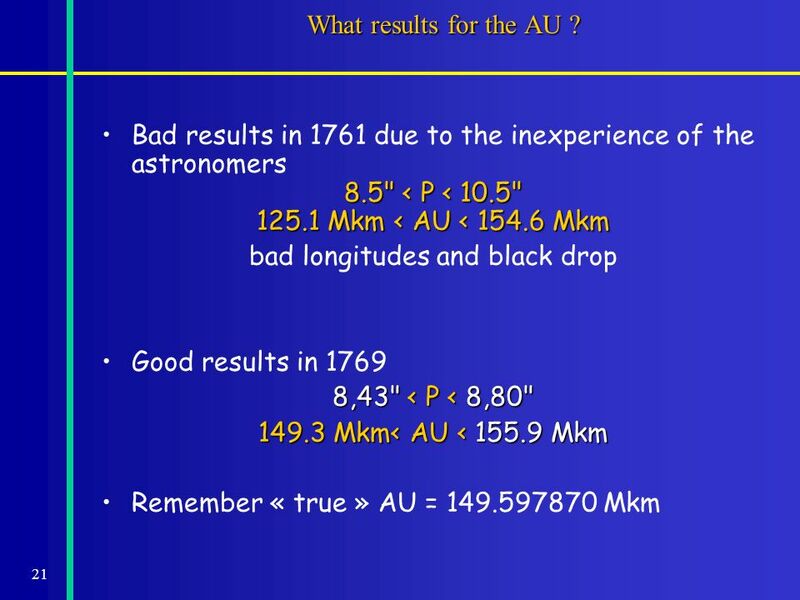 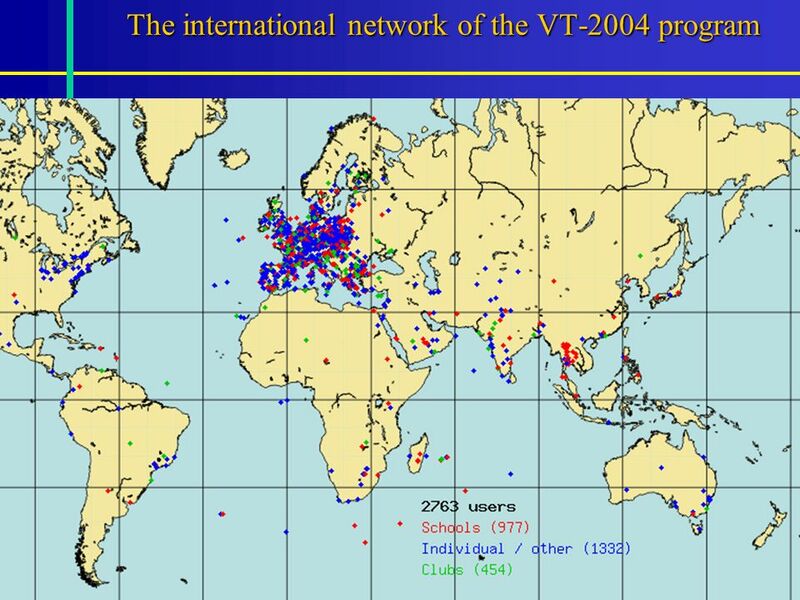 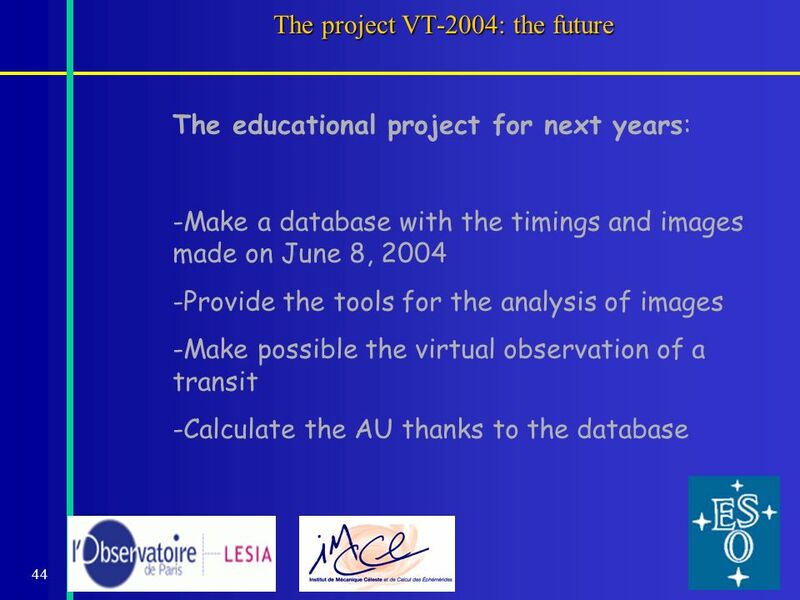 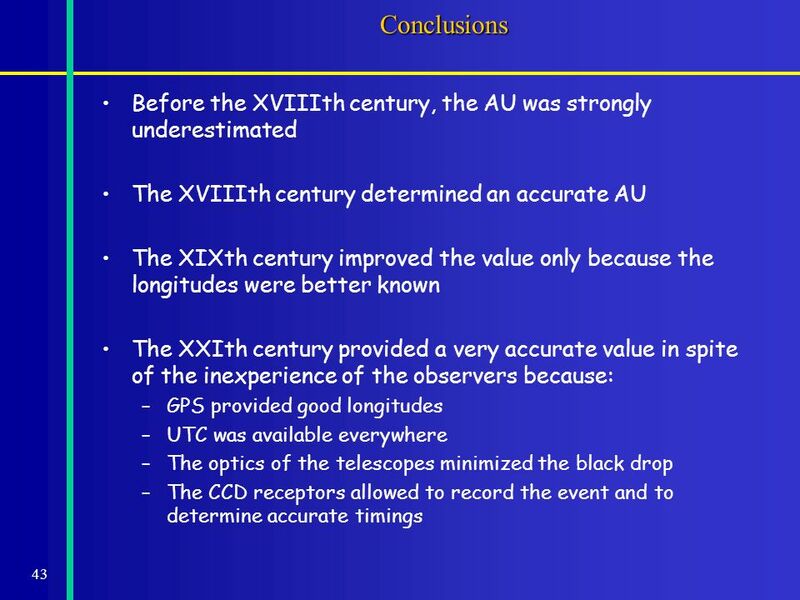 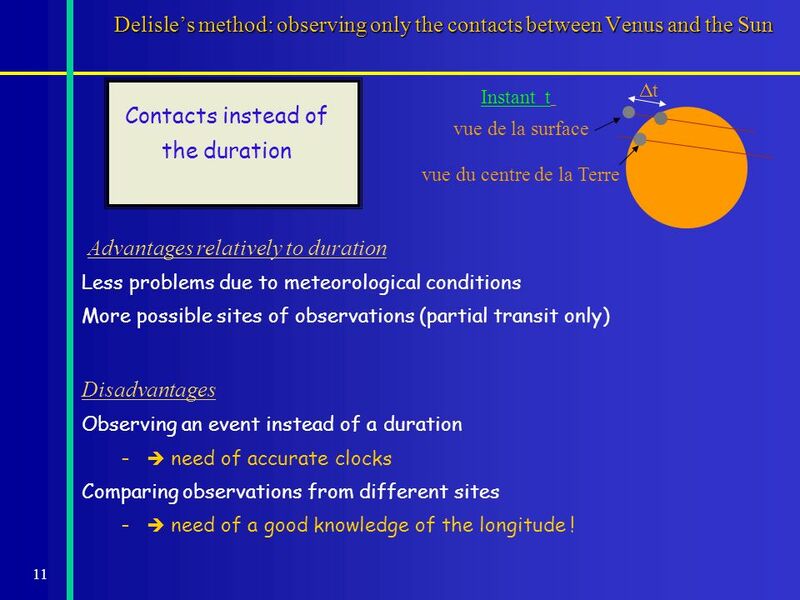 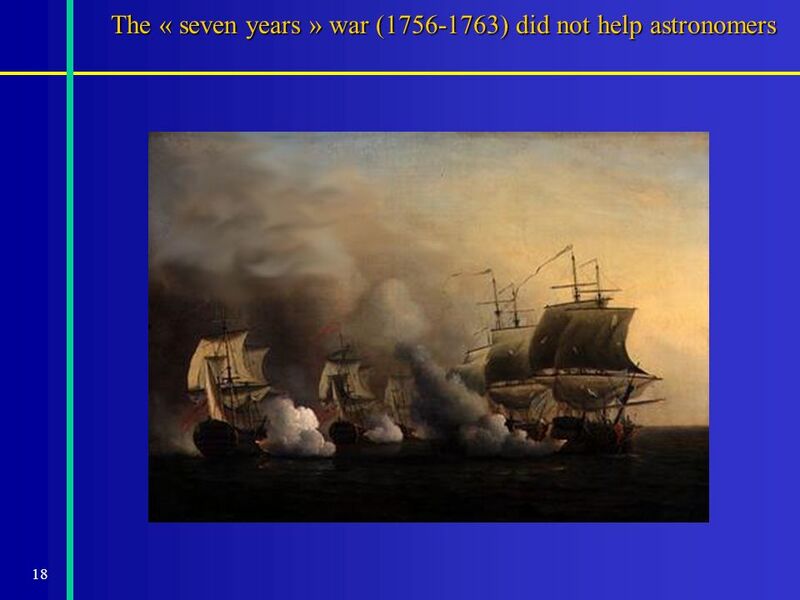 Télécharger ppt "The VT-2004 observing campaign and the Astronomical Unit Jean-Eudes Arlot Directeur de recherche du CNRS Patrick Rocher Astronome à lIMCCE William Thuillot." 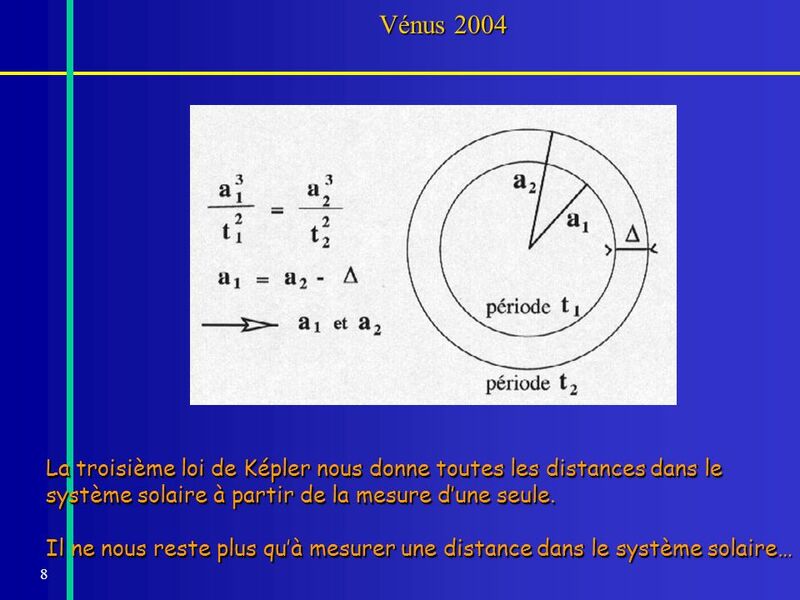 Laboratoire de Bioinformatique des Génomes et des Réseaux Université Libre de Bruxelles, Belgique Introduction Statistics.